Our Holiday Teas are in full swing around here... we start the festive season on the Friday after Thanksgiving with two different tea times. That's the beginning, a tradition for many of our customers. 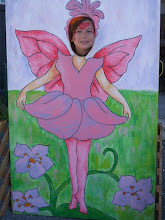 Then we move on to First Saturday followed quickly by our Holiday Tea and Workshop series on Sunday and Monday. Several private events have been scheduled for the first week of December, and there is always SereniTea Wednesday to consider. Everything is red and green, holly leaves and pine boughs. The music has changed, the decor has been added, and the red and green holiday plates are in full use. 'Tis the Season! Hope your holiday celebrations include a visit to a tea room, or perhaps a simple afternoon tea in your living room with a special guest or two. Enjoy the season! Take time for tea! The decorations are up, the culinary Santa collection has reappeard. Don't you just love these two cuties, each with a teapot and tea cup, happy to pour a cup of holiday tea! As part of our Meatless Monday celebrations, we are sharing the Hearty Nachos we prepared. This recipe is provided by Julieanna Hever, R.D. If you google 'hearty nachos', several links to recipes will appear. The Daily Meal included it as one of their suggestions for enjoying a healthy Superbowl party. You can find the recipe here. It is a fun recipe, a meal in itself, but be forewarned that it requires using a wide variety of kitchen appliances. We utilized the blender, the Cuisinart, the cook top, and the oven to pull this together! But once it was done, we enjoyed it with relish. and the memories and love that unite us. For meatless Monday, we have been sampling the recipes shared on the website, Forks Over Knives, and those found in their cookbook of the same name. The recipes are created using whole foods, and encourage following a plant based diet for the many health benefits derived from following this regimen. The Quinoa Stuffed Acorn Squash is a recipe from the Happy Herbivore that was shared on the Forks Over Knives website. We found it to be quite flavorful. Preheat oven to 400ºF. Cut acorn squash in half, place cut side down on a cookie sheet, and bake 30–35 minutes, until fork-tender. Meanwhile, combine quinoa, vegetable broth, curry powder, a few dashes of cinnamon (about 1/4 teaspoon), and raisins in a pot. Bring to a boil, immediately reduce to low, and cook for 15 minutes, or until liquid evaporates. If quinoa is not fluffy after 15 minutes, add more vegetable broth and cook longer. (Sometimes the raisins will absorb the liquid also, so more is needed to cook the quinoa. I find this is particularly true with electric stoves.) After quinoa is done, stir in spinach, add another dash or two of cinnamon, plus salt if desired, then cover and set aside, away from heat. Once acorn squash is done, flip it over and scoop out seedy matter. Then use a sharp knife to cut the point off each base so the acorn bowls sit upright and don’t fall over. Spoon quinoa mixture into squash and serve warm. Sharing a few tea time displays from several tea rooms that we have visited. 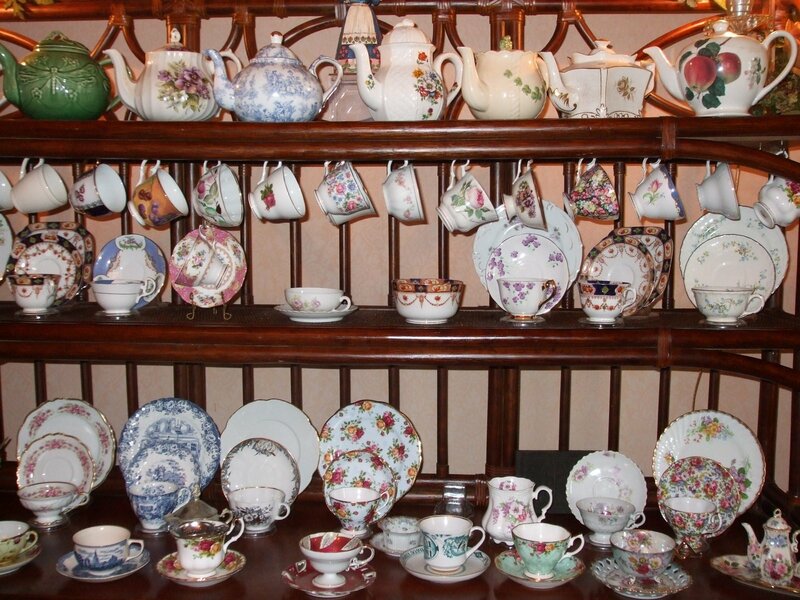 This assortment of teapots, plates, and cups is in the main dining room of Camellia's Sin Tea Parlor in Carlisle, PA. 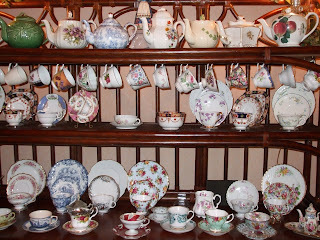 This fun assortment of teapots on the top shelf and assorted teacups and trios (a tea cup, saucer, and dessert plate) was on display in the Victorian Tea Room in Delaware, sadly now closed. And this collection of teacups is hanging in Sweet Remembrances. Have you seen it? A gathering of family and friends recently enjoyed afternoon tea at Camellia's Sin Tea Parlor in Carlisle, PA. Camellia's Sin features a themed menu for the month, and shown here was their Afternoon Tea offered in October. Hats are available to try on, and many in our group had a hat on at one time or another, including a witch's hat. The festive place settings quietly waited in anticipation of the tea treats that were yet to arrive. Assorted pots of hot tea were offered, including Pumpkin, Snowflake, and English Breakfast. The first course was a choice of soup, a mixed bean soup with bacon or butternut squash. The bean soup was thick and quite tasty. A salad of mixed greens topped with apple, cranberries, and blue cheese followed the soup course. Fresh and delicious. A three tiered tray laden with a variety of sandwiches was offered. It featured a nice variety of sandwiches, including a cucumber sandwich, a layered sandwich with carrot and beet fillings, a little ham pastry, and a petite cheesy square. Last, a second tiered tray held a sumptuous array of desserts. A seasonal gingerbread cookie with candy corn, a pumpkin cake, and a petite chocolate cake completed the menu. 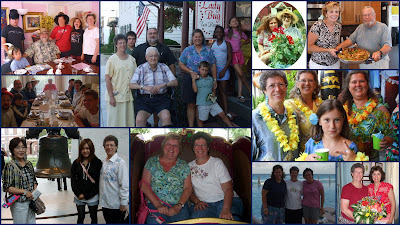 We lingered and laughed and celebrated friendship all the while enjoying good food and creating wonderful memories. This hearty bean soup was easy to prepare, and delicious to consume! This recipe was provided by Spiral Path Farms, our CSA, and with a few modifications, we were quick to taste test it! Saute carrots, celery, and onions in small amount of water until soft. Add garlic, saute an additional minute. Add garbanzo beans; stir. Add diced tomatoes with juice and herbs and spices. Cook 2 minutes. Add tomato sauce and water. On high heat, bring to simmer. Reduce heat to low; cook, stirring occasionally, about 20 minutes. Add kale. Cook, stirring as needed, an additional 10 minutes. Remove bay leaves before serving. Sprinkle individual servings with shredded Parmesan cheese, if desired. Recently, we took a trek to the Maryland Renaissance Faire. In addition to the fun shows and jousts and good food and really attractive costumes, it provided yet another chance to learn about herbs. The living history section provided a glimpse into the way herbs were used to make fragrant pomanders and how the plants were distilled to make floral waters and some essential oils. We took a few moments to learn the top five diseases of the time, their cures and whether you lived or died. French Pox (syphilis) was common but not survivable. Consumption (tuberculosis) literally consumed you leading to a slow demise. Gout common from the poor diet, was excruciatingly painful, but not lethal. The poultice that was applied offered little relief. Leprosy was treated with a map to the lepers colony and a walking stick to help on your journey as well as a bowl so you could catch the food offerings people would toss at you from a distance. Finally, the plague, treated by a plague doctor in full black garb, with the patient marked with a red X, but even with treatment, lead to a quick death alas. Our Presidential Tea was celebrated this past Sunday in anticipation of Election Day. As they were seated, our guests were offered Olde Towne Tavern Raspberry Shrub Spritzer, a delightful combination of Raspberry Shrub, Chablis, and sparking water. Shrub, a colonial-day drink, is a concentrated beverage made by combining fruit, vinegar, and sugar. When mixed with water and/or wine, it yields a refreshing drink that is both tart and sweet. We carry a wide variety of shrub flavors produced by the local Pennsylvania company, Tait Farms, at The Rosemary house. A few of our guests arrived in colonial garb. First course, Spinach Salad with local organic greens, mushrooms, celery, peppers and tomato vinaigrette. The Afternoon Tea sandwich plate featured Apple Beet Relish Boats with Pecan Cream Cheese, Turkey & Provolone Cheese Spirals with Arugula Pesto, Waldorf Chicken Salad Triangles on Multi-grain Bread, Slow Roasted Pork with Peach Conserve Crostini, and a Cucumber Canape with French Style Cheese Spread. Traditional English Cream Scones, Organic Butternut Ginger Tea Bread, accompanied by Sweet Cream and Orange Curd with Fresh Orange Slices was served after the sandwiches. And dessert included a Cheery Cherry Cakette, Ambrosia Tartlets, and Triple Layer Chocolate Peanut Butter Brownies. Following dessert, we were pleased to welcome George Washington, portrayed by Jeff Greenawalt, a first person historical theater interpreter. He regaled us with stories about Washington's life. We enjoyed Mexican Stuffed Peppers the other night, a recipe from the Clean Eating Magazine. Large green bell peppers are stuffed with a beautiful assortment of finely diced onion, pepper, grated zuchinni, minced garlic, corn, tomatoes and red beans, plus a host of seasonings. They are then put into the crock pot and allowed to simmer most of the day, topped with cheese just before serving, and enjoyed by all! The recipe can be found here. This recipe was a winner the first time we served them, that I've made them again. Clean Eating Magazine is about enjoying whole foods in its most natural state, making healthy meal choices and avoiding foods that have ingredients you can't pronouce. I've tried several of their recipes, and have been pleased with the ones that I made. This is a vegetarian meal, but there is a wide variety of all types of food options offered in the magazine. Pink "peppercorns" are from the Baies rose plant, grown on the tiny Reunion Island very near Madagascar. They are not really peppercorns at all but are referred to as such because of their shape and peppery flavor. It is a light and unmistakeably sweet flavor which will add both a splash of color and a delicate fruity heat to your cranberry sauce, mashed potatoes or steamed leafy greens. These berries are softer so they aren't usually ground in a spice mill, instead you can lightly crush them in a mortar and pestle. These pink peppercorns are often slightly higher in price, but you use them sparingly and it is so worth it for the taste. Lemon Pepper is a mixture of cracked black pepper and also lemon zest. You can certainly make your own lemon pepper by zesting the lemon and mixing it with the cracked pepper (allowing the blend to dry first before bottling it). Mixing your own lemon pepper gives you the control to add other seasonings to the blend: garlic granules, onion powder, salt, or other herbs are certainly flavoring options. Lemon pepper is a delicious coating on chicken, fish and even along the edge of a hamburger. Not sure which pepper to use in a meal? Use them all! The berry of the pepper plant (Piper nigrum) is certainly an ubiquitous seasoning. Shown here is a 5 pepper blend consisting of two types of Black peppercorns, White, Green and even Pink "peppercorns". This combination creates a flavorful and colorful blend which is very pretty in a clear acrylic spice mill. Almost every antique or vintage spice chest we have there is a spot saved for pepper. At The Rosemary House, we sell a variety of specialty peppercorns. We sell the peppercorn berries whole and suggest you grind them at home using a pepper mill, spice grinder or a mortar and pestle. Fresh grinding them will ensure freshness and pungency. The typical black peppercorn that you purchase is a blend of Malabar and Lampong peppercorns and yields a robust, hearty and aromatic blend. Malabar is grown in India's state of Malabar. However my favorite is Tellicherry peppercorns a pungent bold berry that is allowed to remain on the vine longer and produce a more complex flavor. It always amazing how one plant (Piper nigrum) can produce so many flavors. The Muntok White peppercorns has its own unique and mellow flavor. It is frequently recommended for adding to cream sauces, since it won't leave little black specs in the sauce! The green peppercorn berries are picked young making it milder than black peppercorns. The top right is a bowl of Szechuan pepper, a main ingredient in Chinese Five-spice powders. This pepper is not from the Piper nigrum but is harvested from a variety of the prickly ash tree, Zanthoxylum piperitum. It is a peppery flavor with citrus notes. Commonly used in many dishes such as Kung Pao chicken, we like it in rice pilaf or scrambled eggs.